$30.00 "Red Army Uniforms 1918 -1945 in Color Photographs", by Shalito, Savchenkov, Roginsky, Tsyplenkov. Softcover, 208 pp. Complete Guide to Uniforms as shown Head-to-Toe in Color Photos. Extremely useful English language reference. $85.00 "NKVD of USSR, 1934-1937. Structure, Command, Uniforms, Insignia". Valentin Voronov , Andrey Shishkin. C. 2005, Moscow. In Russian. This encyclopedic work covers Soviet State Security during its most turbulent period. Highly recommended! $14.00 "Soviet General & Field Rank Officers Uniforms: 1955 to 1991 (Land, Air, Border & Intelligence Services)", by Adrian Streather, C. 2009, Veloce Puiblishing Ltd., United Kingdom. English text paperback 126 pp, dozens of color photos. This excellent book for the first time makes available to the English reader in a concise form information that is otherwise scattered in many mostly Russian language publications. 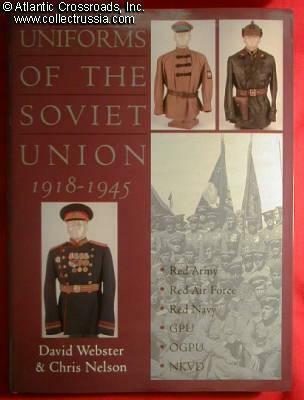 The book covers all uniforms worn by Soviet Marshals, Generals and commissioned officers from the end of Stalin's era through the fall of the Soviet Union - an area of great interest to collectors in the West. A significant part of the book deals with the fakes and gives ample advice on how to spot them. $19.00 "Red Army. Civil War in Russia, 1917 - 1922" Hard cover, Part of the illustrated Russian Language "Soldier" series. $7.00 "Red Army. Civil War in Russia, 1917 - 1922". Smaller format, 5 1/4" x 8 1/4". Russian text. $70.00 "Russian Helmets: from Kaska to Stalshlyem, 1916-2001" Robert Clawson. In English. Textbook on Soviet Helmets with photos and diagrams. Highly recommended! $45.00 "Uniforms of the Russian Air Force, Volume 1 (1890 - 1935)" . Russian with English captions. Outstanding photos and documentary information. A serious reference work for the serious Air Force collector. $30.00 "Uniform Regulations" The official Soviet Handbook on military uniforms. Highly illustrated hardcover by the Ministry of Defense, 1989. Russian text. $10.00 "Regulations on Wearing USSR Orders, Medals, Ribbons, and Badges on Military Uniforms". Large size poster. Shows examples of the correctly decorated uniforms and displays in full color ribbons for all Soviet medals and orders. Russian text. $10.00 Soviet poster titled "Uniforms and Insignia of the Soviet Army Warrant Officers, Extended Duty Servicemen and Females"
$10.00 Soviet poster titled "Uniforms and Insignia of the Soviet Army Officers"
$9.00 "Patches and Chevrons of the Russian Law Enforcement Agencies". English and Russian text. $18.00 "Soviet Arm Badges 1920-91" A. Stepanov, 1999. A detailed photographic guide to sleeve insignia. English and Russian text. $45.00 "Posters of War and Victory 1941 - 1945", by P. Snopkov et al. C 2005, Moscow. Hard cover, Russian text, 240 pp. This catalog includes 210 of some of the best known Soviet WW 2 posters. $47.00 "Field Equipment of the Infantry", 1914-1945, C. 1989, Robert Fisch. Outstanding reference on field equipment of all major participants of WW2 and WW1, including Russia. English text. $35.00 "Restoration of Weapons", by Valeriy Khorev. In Russian, 292 pp, laminated hard cover. Essential "do it yourself" advice on all aspects of edged weapons and antique firearms repair, restoration and preservation. Amply illustrated throughout with b/w and color photos.